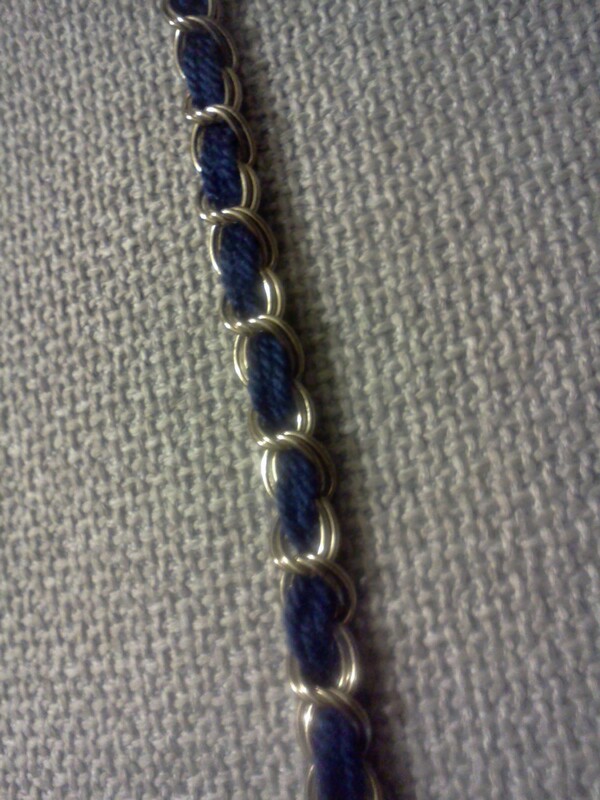 So I haven’t posted in a while, but that doesn’t mean I haven’t been making things. With Justin’s parents only days away from visiting, I’ve been on overdrive preparing the guest room. I’ll be making several posts in the coming days. Let’s start with some wall art. I recently put our new bedding in the guest room and I went on the feminine side with it (You can see it in the background). I want the room to be balanced between masculine and feminine, so I’m using really masculine wall art to try to get that balance. I think silhouettes are very graphic, simple, and masculine. 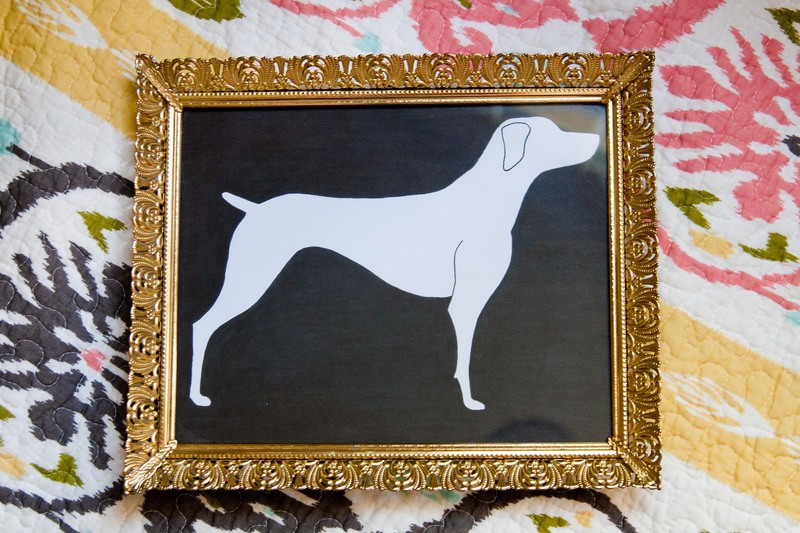 We have a beautiful German Shorthaired Pointer named Bones, and I’ve always loved her lean silhouette, so I decided to use it in our guest room. Here’s what I did. First, I looked at several German Shorthaired Pointer pictures to figure out exactly what I wanted to do. Then, I sketched out my idea (in pencil). Of course, I then drew a new one because the first one sucked. I did this on simple drawing paper from a sketch book. If you’re not so great at drawing, you could always trace a picture you like. Once I thought it was perfect, I traced over the pencil in black ink (felt tipped pens are great). I included an ear and an outline of her front leg because I think it makes the silhouette more fun and quirky. Using a thick black Sharpie, I carefully colored outside of the silhouette. So I guess it’s kind of a reverse silhouette. I went over the black outside about three times so you can’t see the lines from the marker. Finally, I put my picture in this fantastic gold frame I found at a thrift store for a dollar. That’s it! It’s super easy. 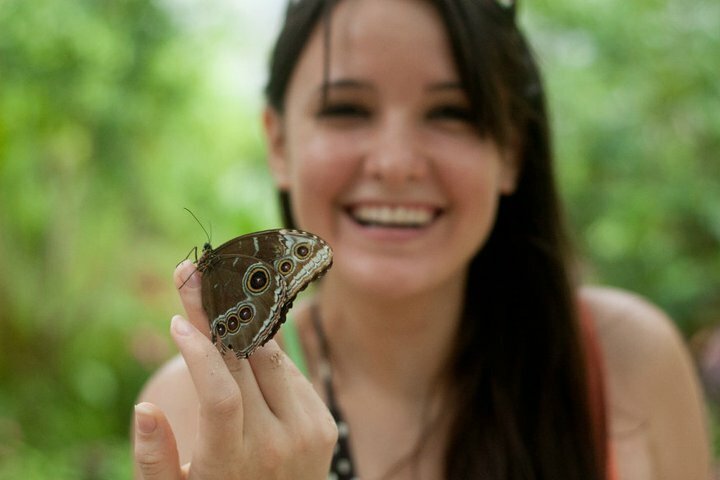 Photos courtesy of my wonderful husband, Justin Brown. 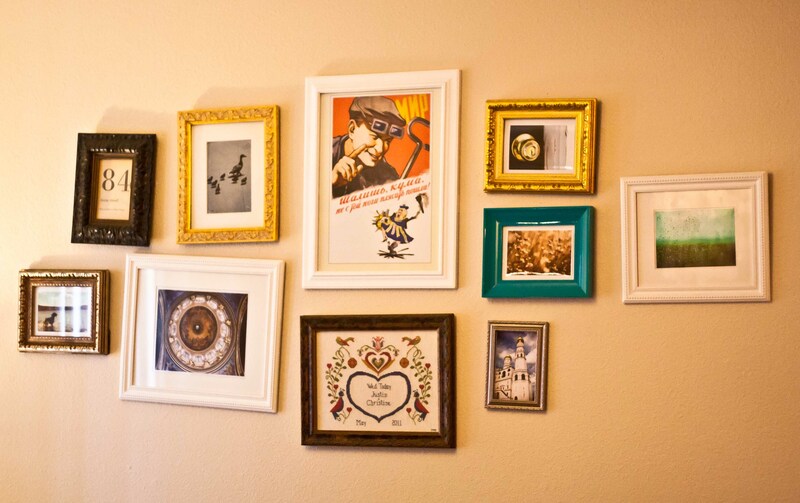 I adore our gallery wall. However, it quickly became apparent that our pictures did not want to stay straight. Apparently a single nail isn’t enough to keep pictures from slanting off to one side. 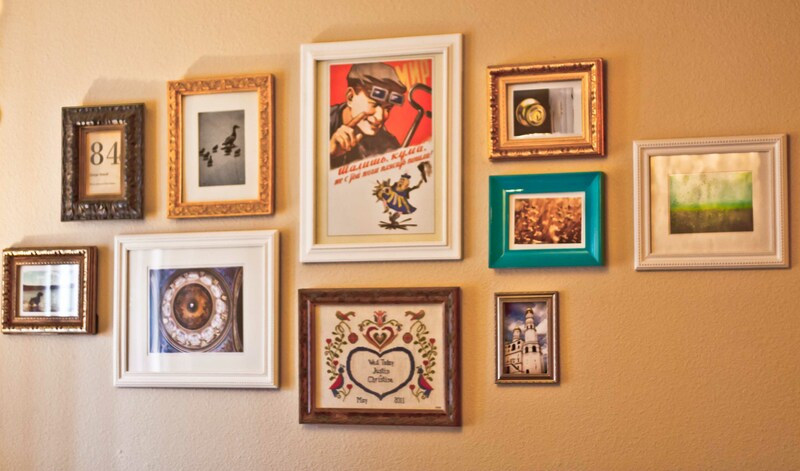 The pictures that were hung with two nails are fine, but some of our frames didn’t have a hook we could use for a second nail. So, I found myself constantly straightening crooked frames. Here’s the before picture. Months later, I have finally decided to tackle that problem. 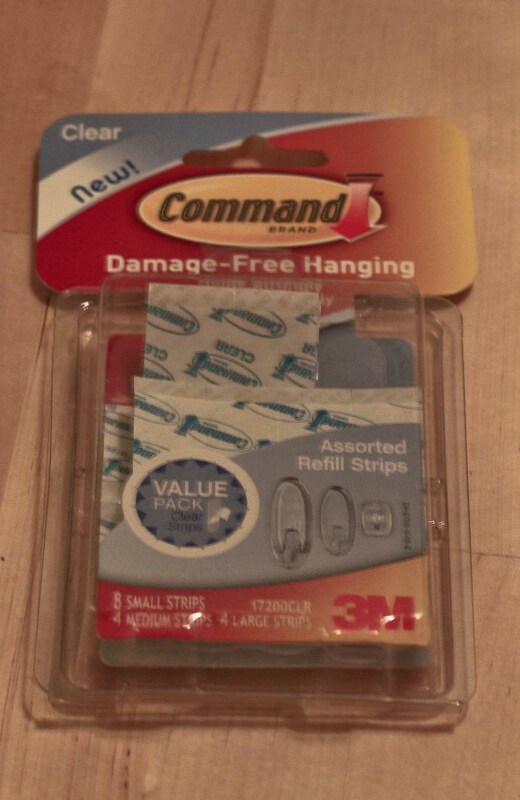 I bought these adhesive strips that are actually meant for wall hooks. Close enough. I got them from Target for under $4. All I did is follow the directions on the package. I only used one strip for each frame and that did the trick! It is so much better! I’m sure I’ll save a few minutes each day by no longer stopping to straighten pictures. Yay! 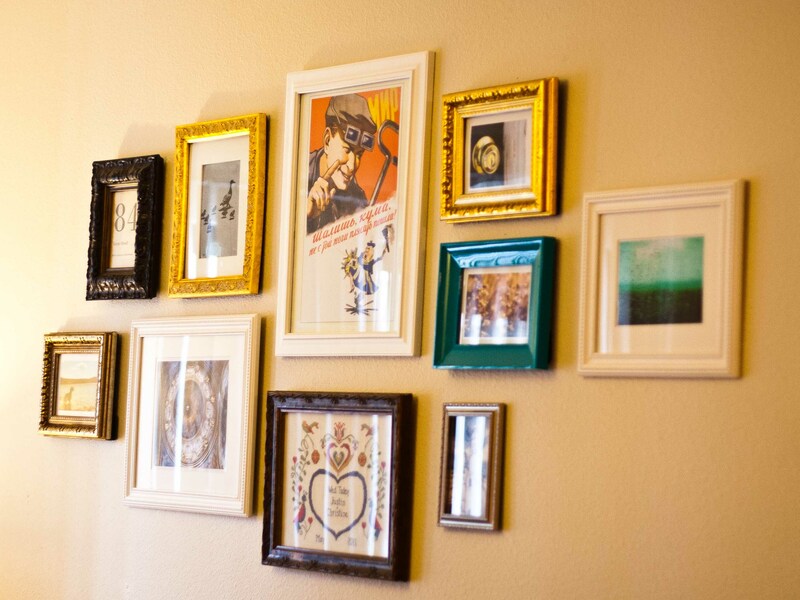 I love my perfectly straight gallery wall! I have a rather large collection of coffee mugs. Every time I see an awesome new coffee cup, I just have to buy it. Especially handmade mugs from art fairs. I used to work at a coffee shop, and one day I realized that I had more coffee cups at home than we had in the entire coffee shop. Yep. 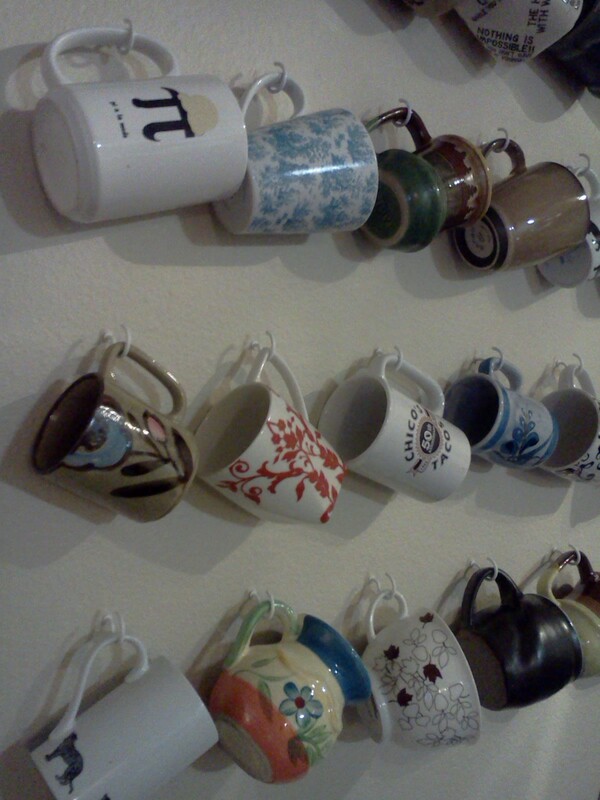 That should give you an idea of how much I love coffee mugs. When my husband and I moved into our apartment, he put a ban on buying new cups. Our cabinets were crammed full of coffee cups and we just couldn’t fit any more. 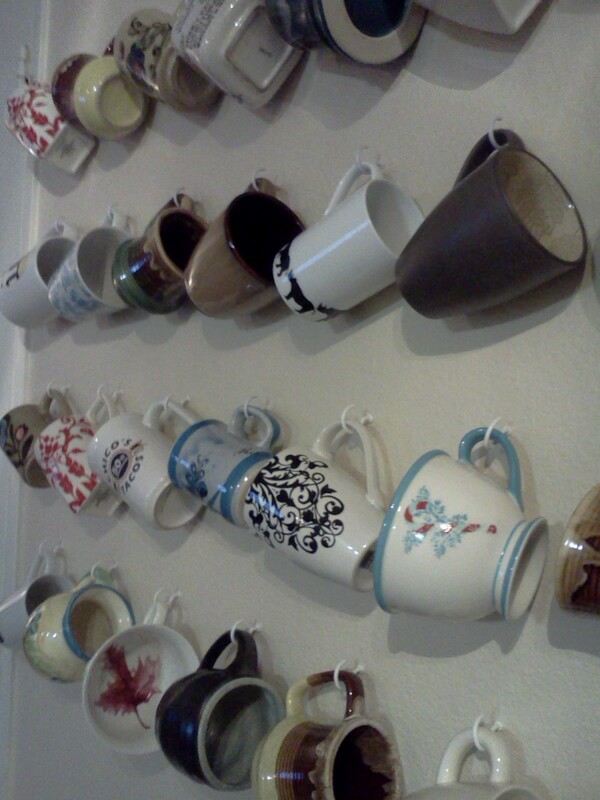 So, while browsing Pinterest recently, I saw this awesome coffee mug storage display idea. It was my inspiration for this project. I haven’t put nearly as many cups up as my inspiration, but it’s definitely a start. 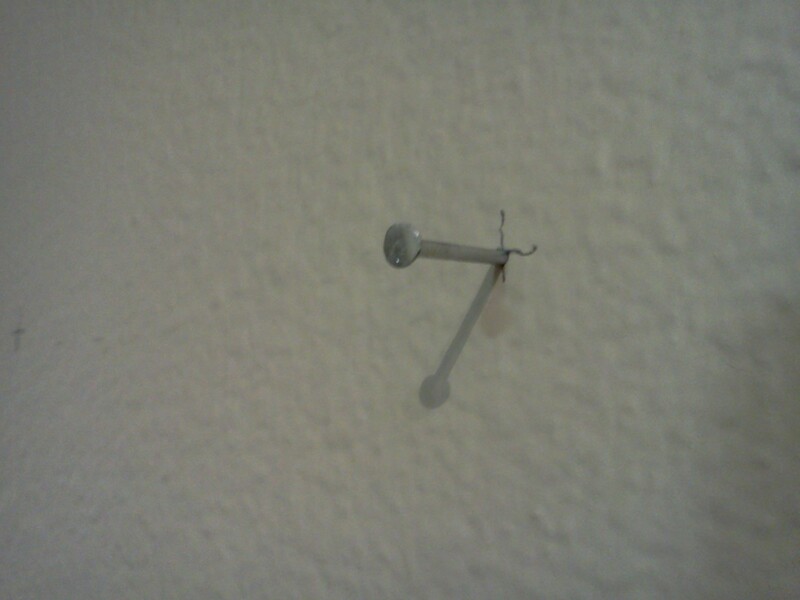 I didn’t want to have to get lumber for this or anything, so I decided to put hooks directly into the wall. My fantastic husband helped me with this project : ) It was easy and very cheap. 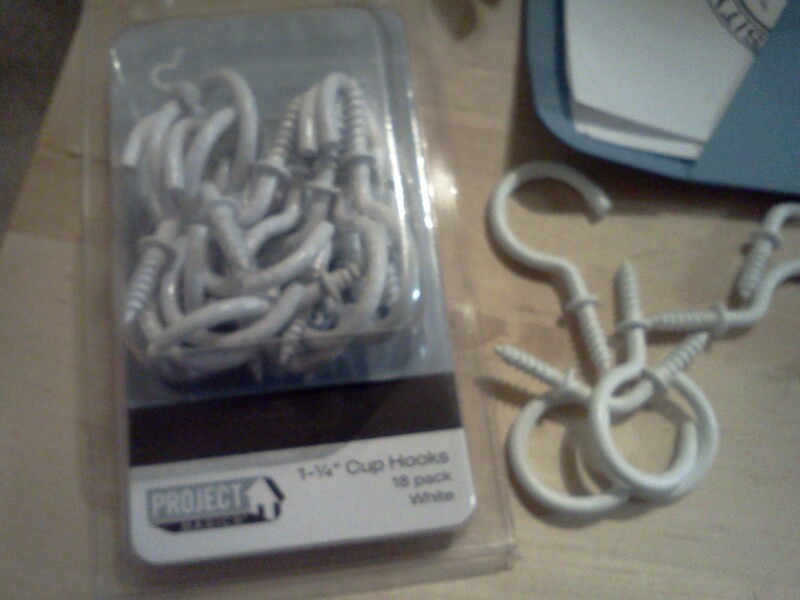 The only expense was the cup hooks and those are only three bucks. It also saved us tons of storage space. After deciding how many cups you want to hang and how far apart you want them to be, start measuring. I made four rows of seven cups. Each row was eight inches apart and each column was five inches apart. Measure and mark where each hook should be. If you have a drill, drill a hole on each mark. If not, nail a hole into each mark, then remove the nail. Erase your pencil marks. Screw in your hooks. Make sure your hook faces upward. Hang your cups! Some of my cups had handles that were too thick to fit into the hooks : ( Oh well. I also have some cups that have the design to the right of the handle and some that have the design to the left of the handle. Because of that, I decided to have my rows of coffee cups alternate in the direction the cups face. That way, all my cups are displaying their cutest side. 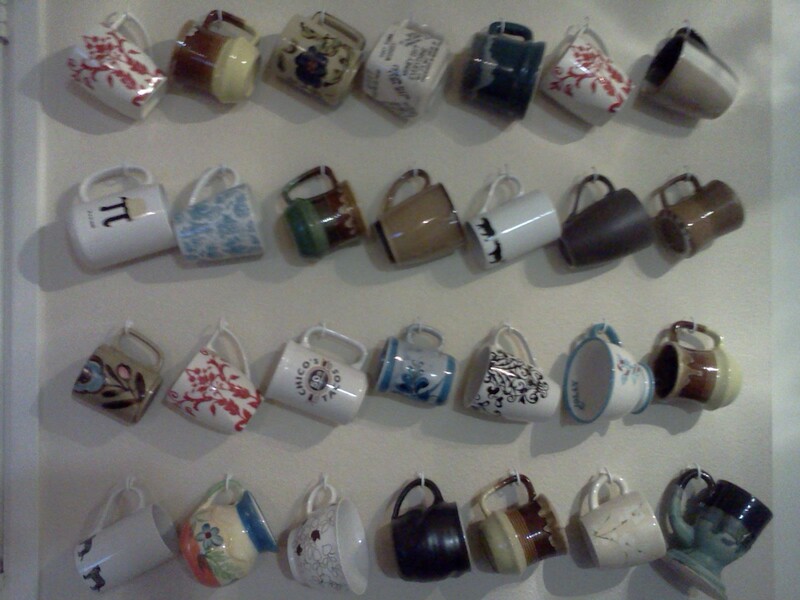 I love my new coffee cup wall! It’s cute and quirky and it definitely screams “Christine!” Also, I’m so excited that I get to start buying more coffee mugs again! I haven’t posted in a week because I’ve been procrastinating. I knew I wanted to do this project, but I was dreading it. I’ve been trying to bring more organization into our home, and today I’m organizing the pantry. I recently bought some cute containers at IKEA, and I finally opened a set of containers we got as a wedding gift last year. It’s about time I put them to use. I thought about posting a before picture, but trust me it’s not pretty. You do not want to see what this pantry looked like pre-organization. I have some solid containers and some clear containers, so I’m using the glass ones to hold stuff that looks pretty. Pasta, oats, things like that. Anything that should be shielded from light (like coffee) is going into solid containers. Some of my containers have little spoons attached to them. Super cute and so useful. I haven’t printed any labels yet because I want to try living with this organization system for a while first. I don’t want to have to redo labels after I find out my lentil container is way too small. 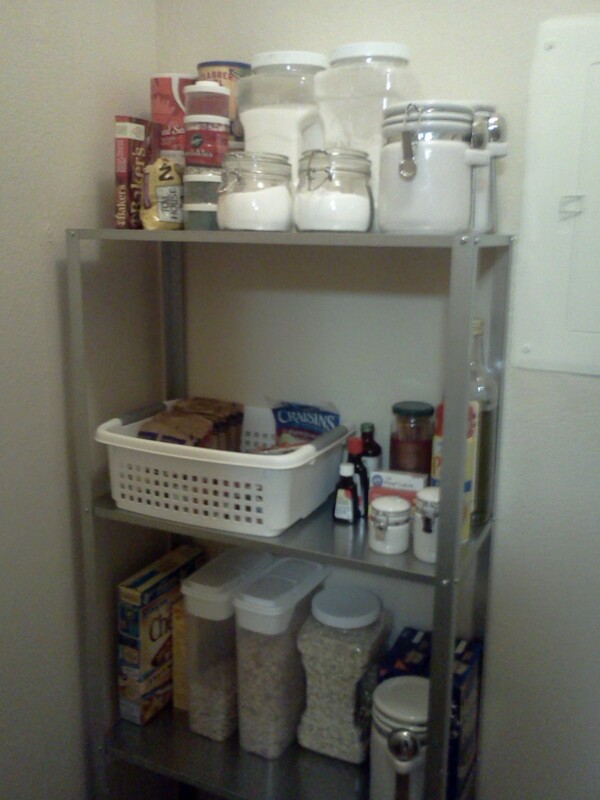 So, without further ado, I reveal… the Organized Pantry!!! 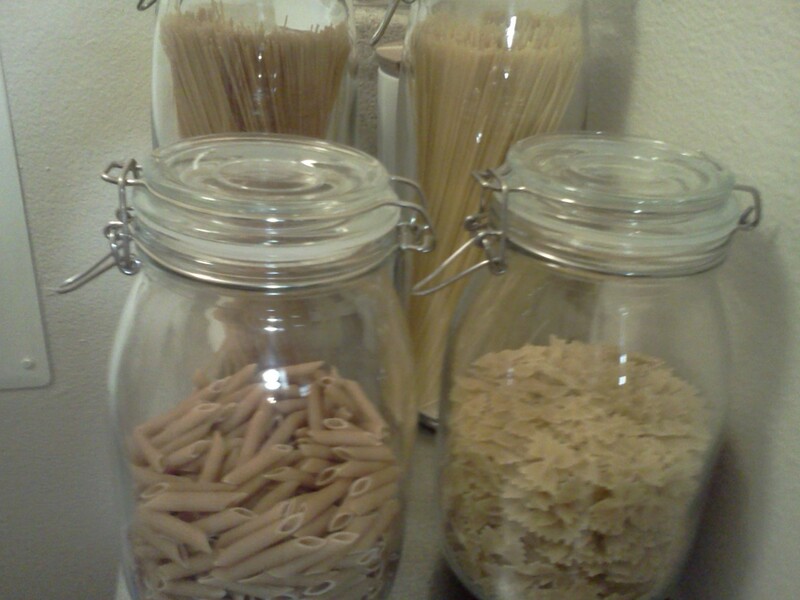 Some stuff looked too messy if I just put it on the shelves, so I got two containers to hold things like that. 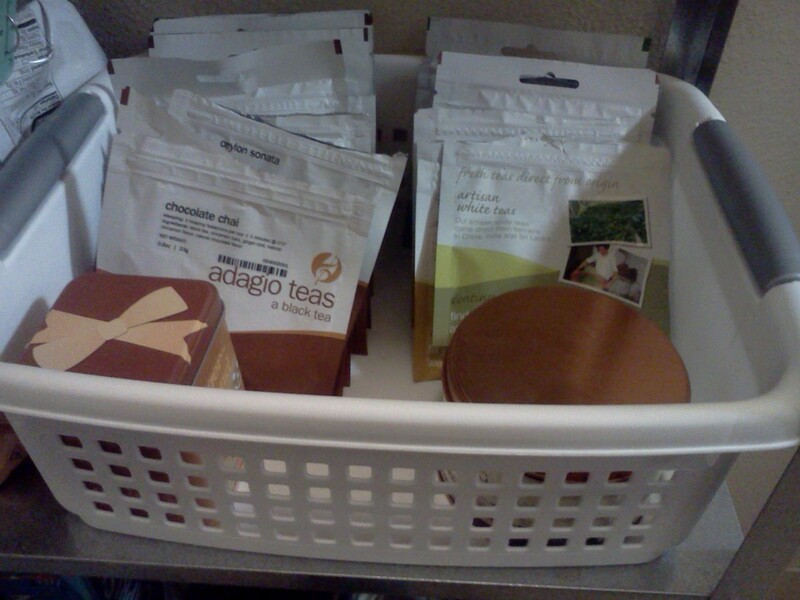 Mostly individually packaged stuff like my husband’s loose-leaf tea. It looks so much better in this container! There you have it. It is a massive improvement! I also reorganized all our pots and pans, but the cabinets are too dark to look decent in a picture. 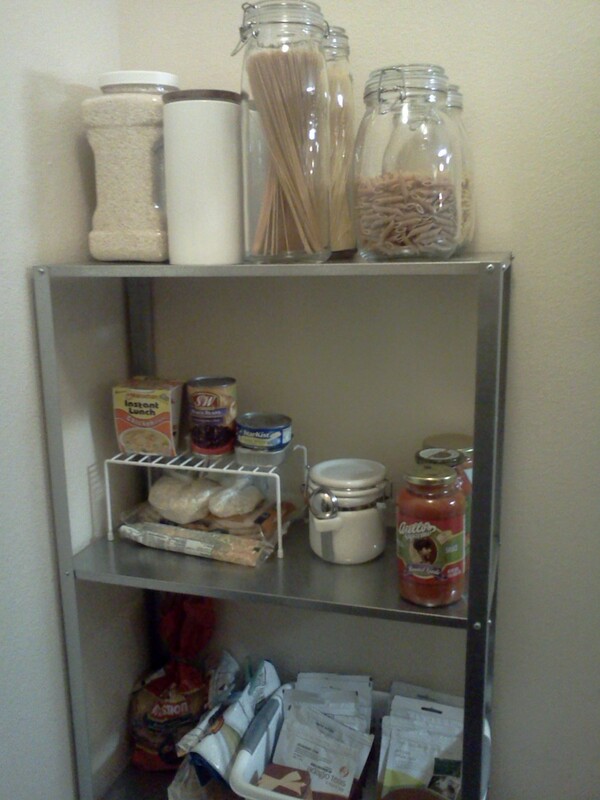 I kept procrastinating when it came to the pantry, but I’m really glad I finally did it. It wasn’t as difficult as I expected, but it made a huge difference. You should do it too! I started doing a lot of DIY stuff last year when I was planning my wedding. Every time I saw something I loved I would google and say, “WHAT?! It costs how much?! I can just make it myself!” I ended up designing and making our invitations, RSVP cards, table numbers, pennant banners, flower girl baskets, card box, seating board, and more. And the result was a wedding that looked more expensive than it was… and it was EXACTLY my style. Because of my DIY savings, we were able to splurge a bit on an amazing venue with great catering. A DIY monster was born. So… why did I choose DIY in Design as the title of my blog? Well, I love watching design shows and I’m constantly trying to decorate our new apartment in a way that shows my style–with just a hint of my husband’s style ; ) When I see something I like on TV, online, or in a story, I often try to make it myself. 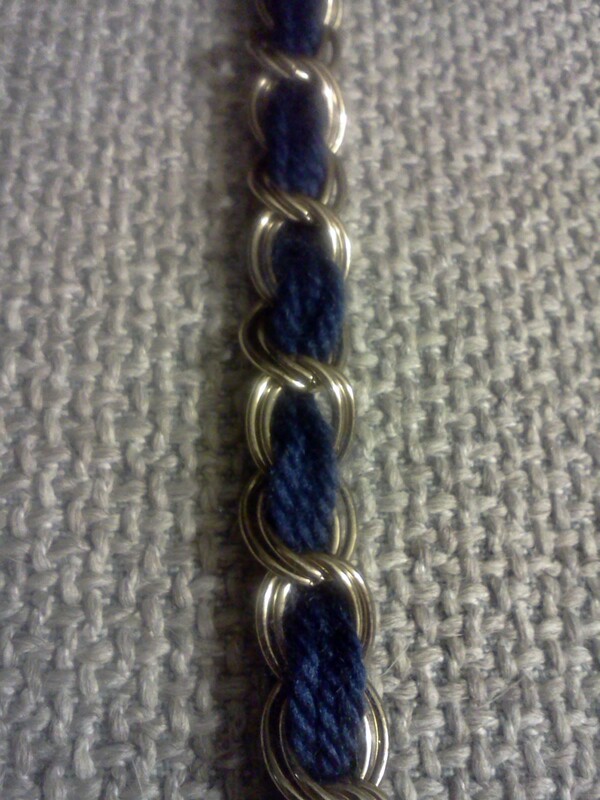 If I can’t make it myself, I can usually make something comparable or find it cheaper online or in an antique store. 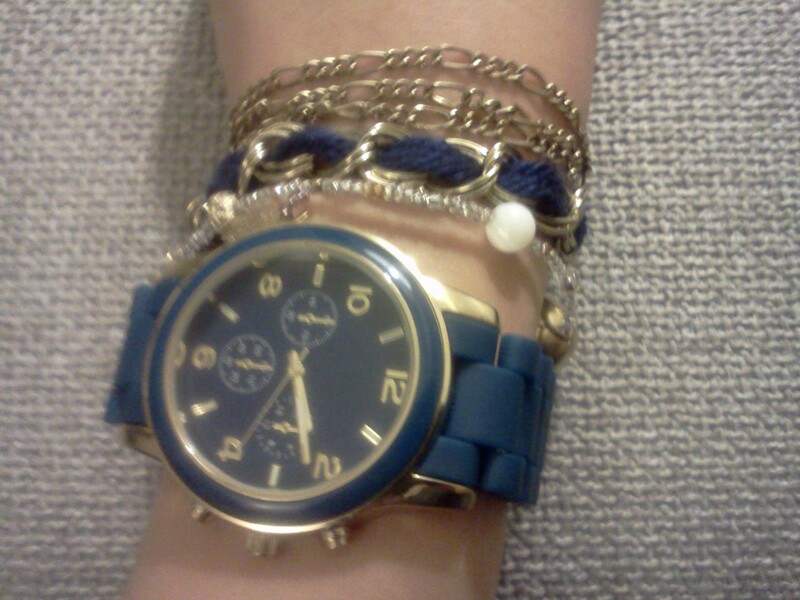 So when you see something awesome, but expensive, just do it yourself! 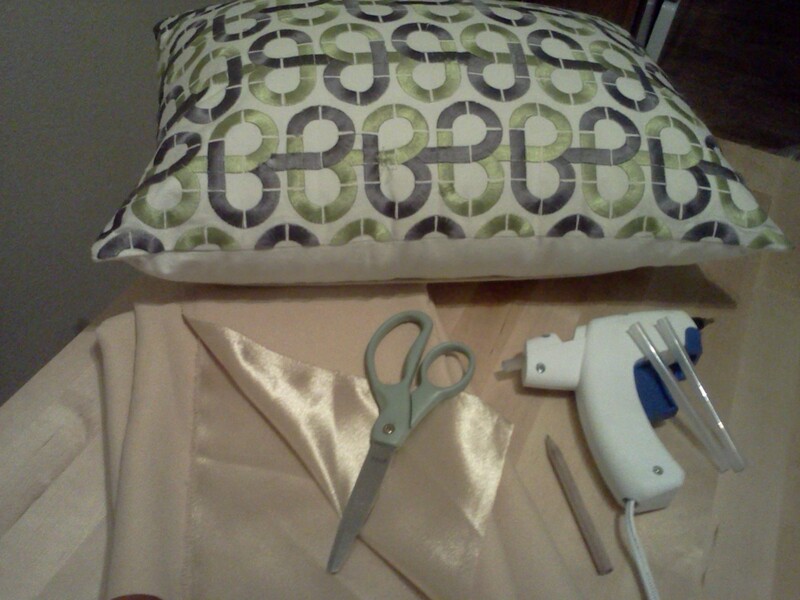 If you do it yourself in your own design, not only is it cheaper, but you can personalize it and make it your own! When someone comes over and says “Wow! Where’d you get that?,” you get to see their surprise when you tell them you made it yourself. Sometimes, there’s something you just have to have, but you can’t make yourself. Like an awesome couch or amazing retro dining chairs. When those times come, hopefully you’ve saved enough by doing DIY stuff that you’ve earned a bit of a splurge : ) Just like we did with our wedding! My final reason you should bring DIY into your design is because we all have days when we’re bored and can’t find anything to do. A good DIY project solves that problem and at the end of the day, you have something to show for it! 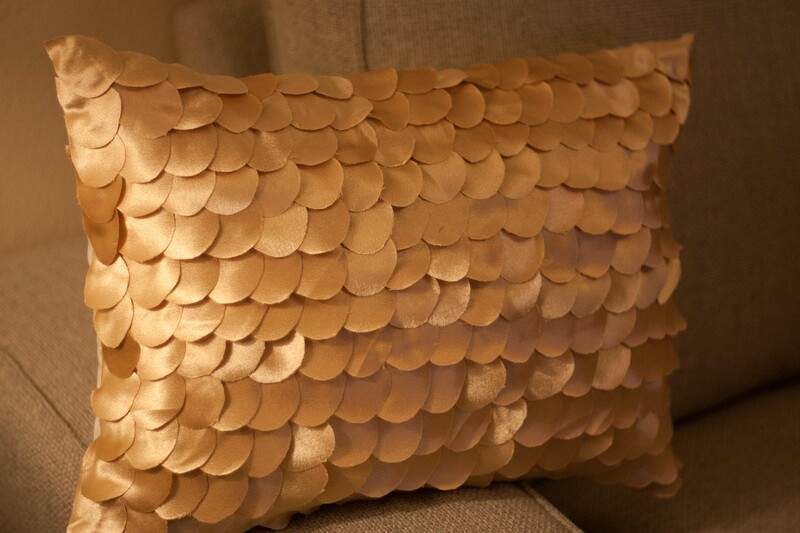 So, if you’re a penny-pincher, if you’re bored, if you can’t find EXACTLY what you want, if you want to impress your friends, or if you just love doing DIY stuff, try putting DIY into your design. First post ever! So I’ve never had a blog before, and I really wasn’t interested in getting one. 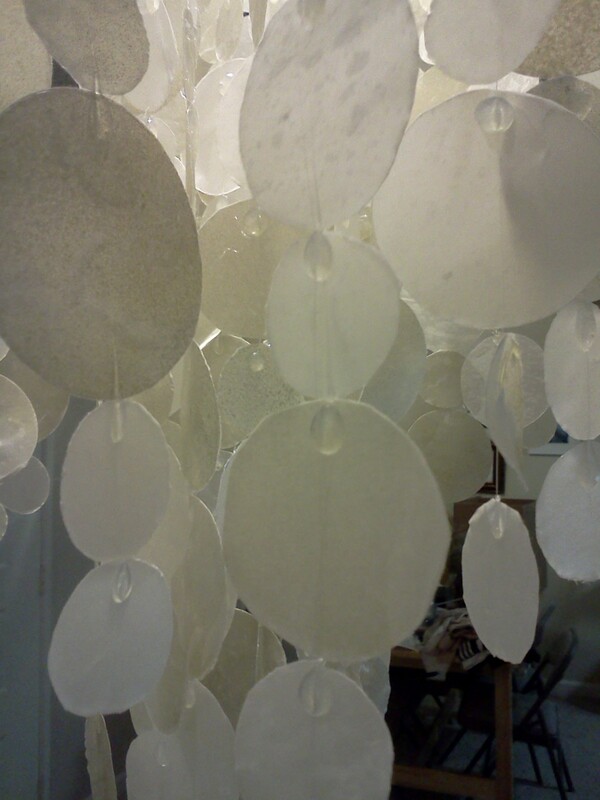 Then, I pinned a couple of pictures of a DIY Capiz Shell Chandelier I made. You can check them out here, on my DIY board on Pinterest. 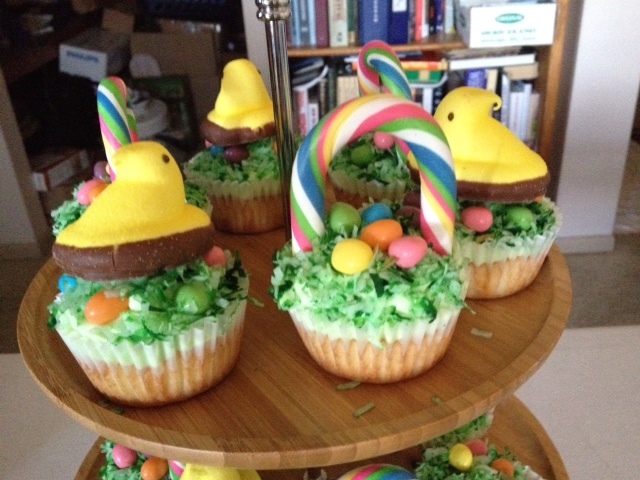 After I pinned them, I started getting requests that I post instructions on how to make it. Instead of posting instructions in some giant, awkward comment on Pinterest, I decided to start a blog. My new blog will chronicle my DIY adventures and my progress in decorating the apartment I share with my husband and our dog, Bones. So, since the chandelier is what got me to start blogging, I thought it fitting to have my first post be a how-to on making a DIY capiz shell chandelier! 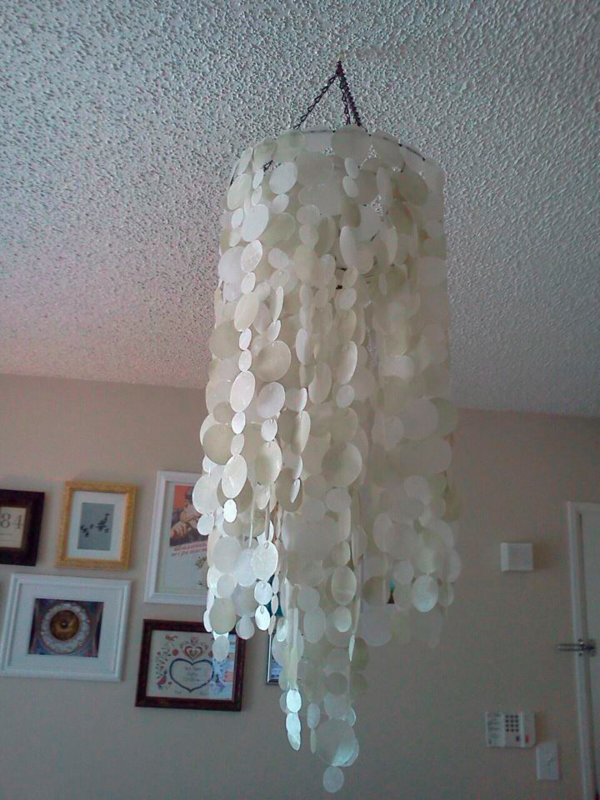 I kept seeing wax paper capiz shell chandeliers online, and they seemed simple enough to make. I mentioned the idea to my friend, Roslyn, and we decided to make some together. Neither of us wanted to make ours quite how they showed online, so we made our own little tweaks to the project. Roslyn made her wax paper shells in heart shapes, and it looks wonderful in her new nursery! Maybe I can convince her to let me post some pictures of hers later. For now, I’ll focus on mine. The first thing I did, and the first thing I think you should do, is find inspiration online. 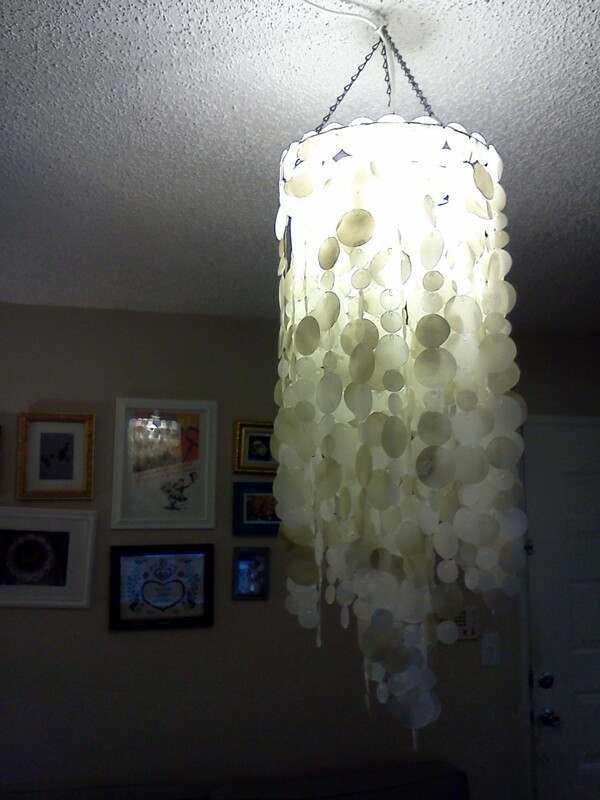 I searched google for real capiz shell chandeliers, and found one I absolutely loved. You can see my inspiration chandelier here, on my Pinterest. It’s an amazing West Elm Chandelier that isn’t even sold anymore, but when it was it cost a whopping $259. Not exactly in my budget. And if you’re reading this, it’s probably not in your budget either. Parchment Paper- I already had a roll of parchment paper, and you only need two sheets of it. The sheets should be 2-3 feet in length. Total cost is between $10 and $20 depending on what supplies you already have on-hand. Now that’s MUCH better than $259! Once you gather everything, it’s off to work! Step One: (Optional) Spray-paint your hanging basket if you want to. I decided not to since my inspiration chandelier had a black base just like my hanging basket. Before you spray-paint your basket, remove the liner. If you spray-paint it, be sure to do it in a well-ventilated area. Hang it somewhere outside and make sure you spray it from all angles. Give it a second coat, then let it dry for at least an hour. Follow the directions on your can of spray paint. Step Two: (Also Optional) Spray paint some of your wax paper. I chose to have some gold “shells” and some plain (white-ish) “shells.” Roll out a long strip of wax paper, and spray it in a somewhat random pattern to give your shells some dimension and character. I did two coats on my roughly 25 feet of wax paper. If you’re doing this step outside, which you should, you may find it necessary to weigh the paper down every few feet so the wind doesn’t blow it away. Let it dry! Once it’s fully dried, you can roll it back up. 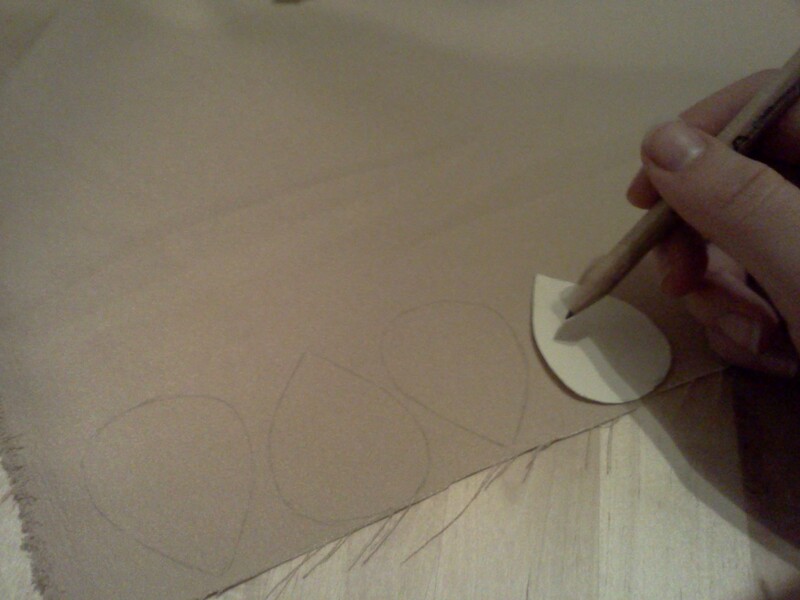 Step 3: Cut three sheets of wax paper. Make them as close to the same size as you can. They should be 2 to 3 feet, or whatever you’re comfortable with. Stack the sheets on top of each other. If you spray painted some wax paper, cut only one sheet of the painted wax paper. Sandwich that sheet between two normal sheets of wax paper. Once you have your three sheets stacked, sandwich those between two sheets of parchment paper. The wax paper should NOT stick out of the parchment paper. This is very important because you will be ironing the sheets, and the parchment paper is there so the wax paper doesn’t melt and get stuck to the iron or the ironing board. Step 4: Iron! Again, be sure that you are only letting the iron directly touch the parchment paper, and not the wax paper. Don’t let the wax paper touch the ironing board either. You may need to go over the sheets with the iron a few times until the three sheets of wax paper are completely stuck together. Don’t worry about little air bubbles. Those give the “shells” character and help them look more like real capiz shells. Once the wax paper becomes one sheet, remove it from between the two sheets of parchment paper. Repeat steps 3 and 4 several times until you have many sheets of prepared wax paper. Since I wanted to have some shells be gold and some be plain, I did not include painted wax paper in some of my sheets. This step and the next step get pretty boring, so feel free to switch between ironing and cutting circles every once in a while. Do not use the steam setting on your iron. If your iron has a tendency to leak a bit of water, fully empty it before starting. 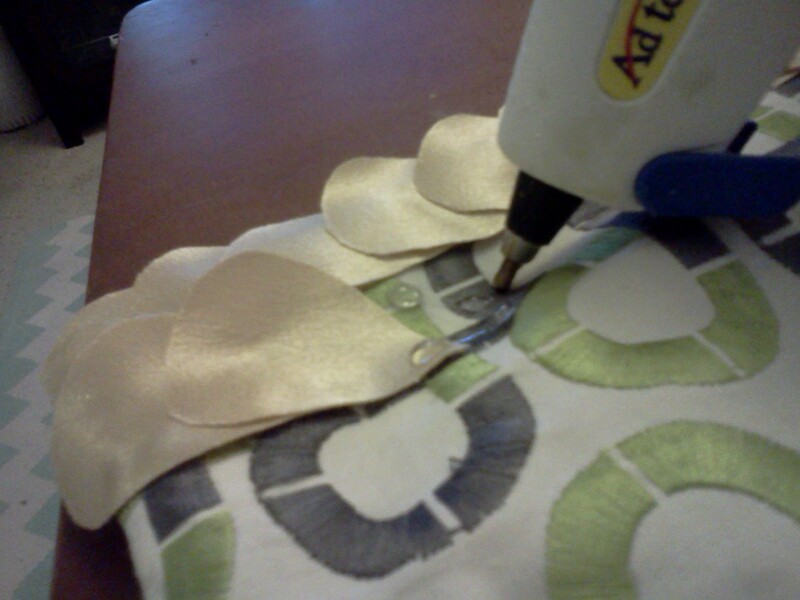 Step 5: Time to cut some circles! If you have a circle cutter, this will be much easier. Accordion-fold your wax paper according to the size of your circles. If you are using a circle cutter, put it in place and punch it. I found that having 5 layers at a time worked the best with my circle cutter. If you don’t have a circle cutter, find something the right size and shape and trace it over and over in a line on the wax paper. Accordion-fold your wax paper and start cutting with the scissors. Again, 5 layers worked for me, but it can vary based on how sharp your scissors are. It works a lot better if your scissors are new and sharp. Trust me. I tried it with my crappy old scissors. Not good. Don’t worry if when you punch or cut circles they aren’t perfect. The crappier circles can go in the back. Repeat this step until all your circles are cut out! (You might continue to the later steps, then come back to this one when you find you need more) I used three different sizes for my circles. 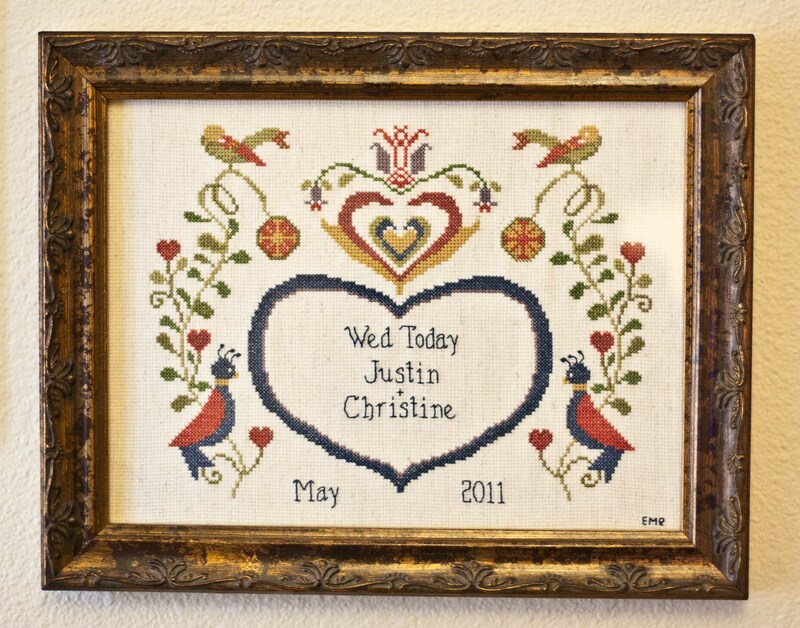 For the large circles, I used my 2″ circle cutter. For the medium circles, I traced a thing we have that measures shots. It is about 1 1/2″ in diameter. For the small circles, I traced the lid of a soy sauce bottle. It is about 1″ in diameter. Step 6: If you’re using different colors and/or sizes for your circles, this is an important step. Lay out your circles in a few lines, arranging the circles in whatever way you like. I wanted mine to seem random, but I also didn’t want to have too many of the same shape or color next to each other. 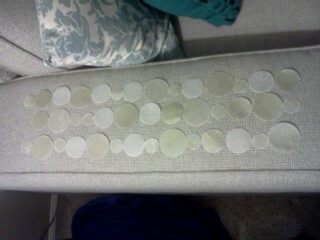 I’m including a picture so you can see an example of how I arranged my circles. Step 7: With your circles arranged in a line, put a small dot of hot glue at the top of each circle, and glue fishing line to them. You should end up with a long string of circles. Make each string of circles whatever length you want them to be on your chandelier. Since this is a three-tiered chandelier, you may need to make three different lengths. The strings for each tier don’t need to be exactly the same length, but you should try to have them not vary by more than two inches in the same tier. The following picture shows the dots of hot glue and the fishing line. I don’t have a picture showing me gluing the circles, but hopefully you get the idea from this. 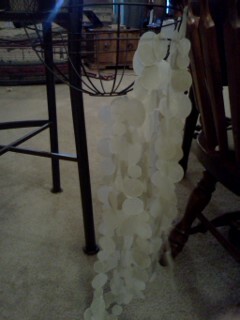 Step 8: String them up! You can tie the fishing line to the hanging basket or you can hot glue them. I found it easier to hot glue them. Try to cover the basket as much as you can, not leaving any space between the circles glued to the frame. Start from the inmost, lowest tier. It’s easier that way. On one little section of mine, I did all three sections first just so I could see what the lengths would look like together. 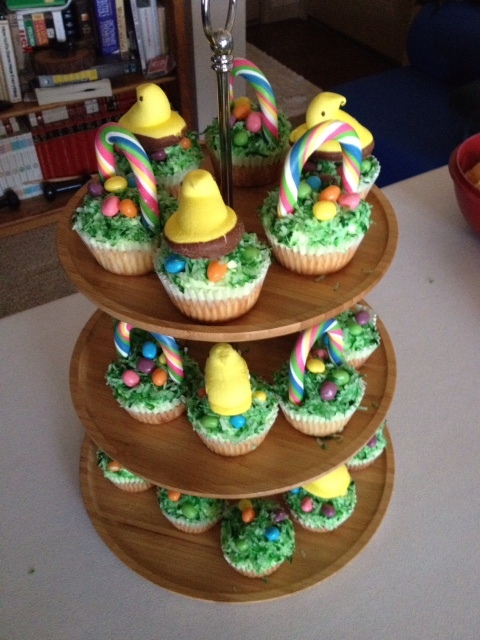 Then, I completed the bottom tier, then the middle, then the top. It is a lot easier if you have your chandelier hanging from something as you do this step. I hung mine from the back of a barstool. Once I finished hanging all my strings, I hot glued individual circles to the exposed wires from the basket. By this, I mean the metal running vertically rather than horizontally. You don’t have to do that, I just think it looks better if you do. It isn’t as important if you spray painted your hanging basket. The following image shows the chandelier from the top. 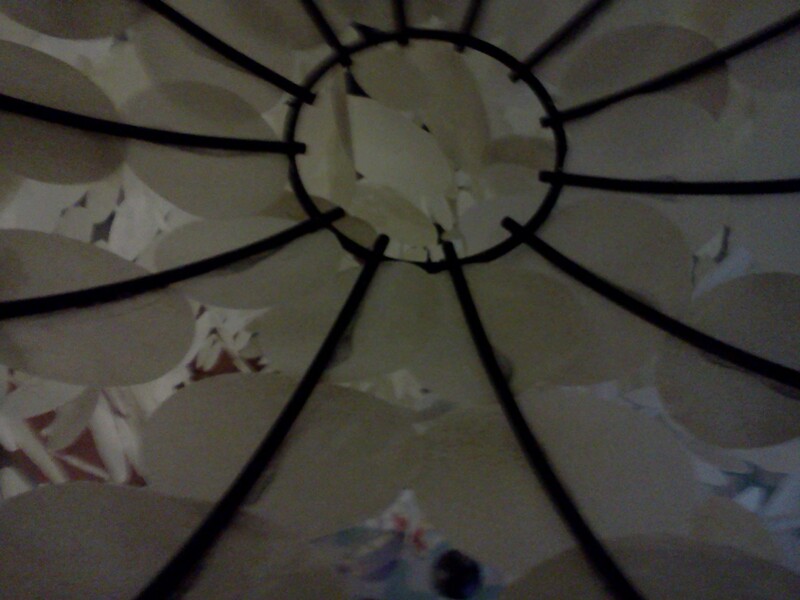 You can see the circles I glued to the basket’s wiring in order to better hide the frame of the chandelier. Step 9: Screw your hook into the ceiling and hang your chandelier. If you bought a hanging light for it, hang that as well, being sure the light bulb does not touch the wax paper. Keep it a safe distance from the wax paper to avoid any fire risk. It looks great in the center of a room. It can also go in the corner of a room, or wherever you want! If you have an existing overhead light, just hang your chandelier right there. *Additional options: Use ribbon instead of fishing line, sew circles instead of gluing them, make a sconce or lamp instead of a chandelier, use a basket or the base of an old lamp shade instead of a hanging basket, vary the length- I wanted mine to be quite long, so from the top of the basket to the bottommost tier, mine is a bit longer than 3 feet, try shapes like stars or hearts instead of circles, or replace the hanging basket chain with ribbon, yarn, or twine. Try out some other colors- you can use spray paint like I did or you can try filling the wax paper with crayon shavings of a particular color. Or multiple colors. Ros and I tried that, but we decided it was just too much. I think spray paint is much easier. You can also vary the amount of wax paper in each completed sheet. I used three, but feel free to experiment with more or fewer.